The Food We Eat Poster. Prayer, Grace, Blessings, Meals, Sunday School. The Food We Eat Poster. You'll receive a JPEG that can be printed up to 24" x 30" and a PDF that can be printed on regular 8.5" x 11" paper. 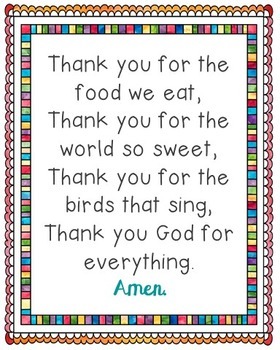 prayer, blessing, bible verse, for children, for kids, mealtime prayer, dinner prayer, God, Lord, Jesus, Christian, Catholic, Baptist, Methodist, homeschool, memorization, colorful, stained glass design, Sunday School, grace, private school.